How can we help parents keep up with what is going on in and around the school? How can we bring parents together to suggest improvements to the high school experience for all students? Should we provide programs and information about trends in education and/or adolescent development? Join us on Thursday, September 19 to hear from key administrators and veteran parents. For the third consecutive school year, Evanston Township High School (ETHS) District 202 will host a series of Community Conversations, a series of discussions that allow stakeholders to engage in a meaningful dialogue about the high school. Prospective or new ETHS families, District 202 community members, business owners, and people who work in Evanston/Skokie organizations or businesses are invited to join District 202 Superintendent Eric Witherspoon for the 2013 Community Conversations. Staff members from ETHS will be available to answer questions, help refine understanding of key issues, and build awareness of the school’s current efforts. 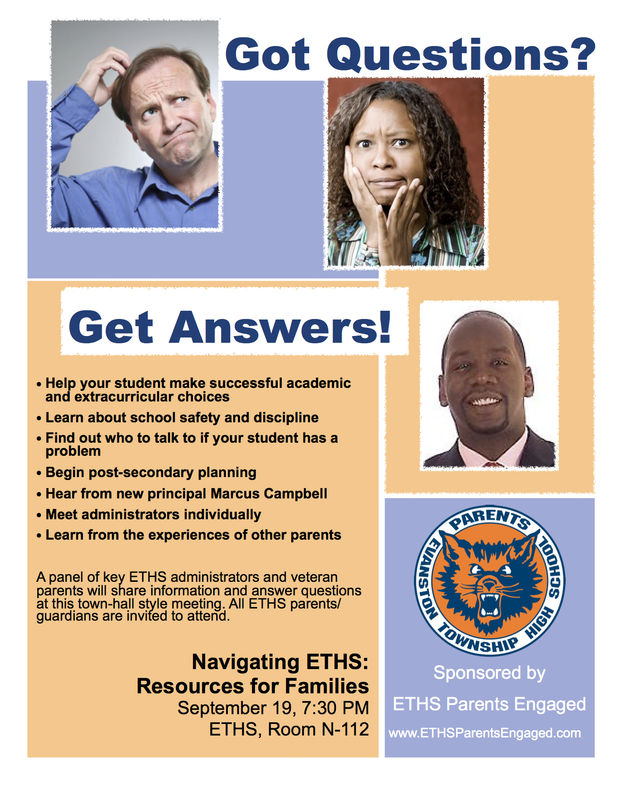 Since each student’s high school experience is unique, ETHS also encourages participation by families who have enrolled children at ETHS in the past and may be sending their younger children to ETHS. ETHS Community Conversations are free and open to the public. For more information, visit the Community Conversations page on the ETHS website (www.eths.k12.il.us/community/conversations/), or contact the ETHS Communications Office at communications@eths.k12.il.us or 847-424-7515. Si necesitan ayuda en español por favor llamen a la Oficina del Enlace Latino al 847-424-7166.